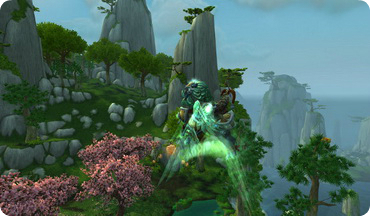 World of Warcraft players are welcoming another new patch of the game, Patch 5.4. This patch is set to bring with it a slew of changes and additions to professions and the items that can be created. Let’s see what the changes are and will your characters get advantages from the changes. There are three main types of items being added that can crafted by players. There are a few new materials to create; there are PVE items that can be crafted, and a new set of PVP items. There are also many changes to existing items that can be crafted, the biggest being to enchantments. After Patch 5.4 is released, you can create several new crafting materials in the game. The new added materials will be created to craft the new higher level PVE items that are also being added in Patch 5.4. Tailors can have celestial cloth which requires 10 bolts of windwool cloth. And blacksmithing is added with balanced trillium ingot, which requires 1 trillium bar. Leatherworking is added with hardened magnificent hide, which requires 2 magnificent hides. All of the above items can only be crafted once per day, limiting the amount you can get significantly. Both Blacksmithing and Tailoring have gained new PVE crafted items, which are item level 545 belts and pants. Tailors have a DPS and a Healing set available, while Blacksmiths can have a DPS, Healer, and Tanking set. To craft these items you need to create the new crafted materials first, and most of them cost roughly 20 of the new items. This means that it will take at least 20 days for you to gain the new items. While till now only they only confirmed that Tailoring and Blacksmithing will have new items, it only makes sense that Leatherworking will gain similar items at some point in the future before the PTR ends and the patch goes live. For season 14 there is a whole new set of crafted PVP gear available to craft. Each of the main crafting professions (Tailoring, Leatherworking, and Blacksmithing) is able to create appropriate item level 476 epic gears for each class and spec. This means that each of the professions has a whole lot of new patterns to learn. These patterns will be learned by completing your daily cooldowns for each profession. This means that initially at least you may have a market on the auction house for some of these items as not everyone will have the patterns. While there are a few new enchants most of the changes to the profession come in the way many enchants now work. Many enchants can now be applied to items with either no minimum level requirement, or a lower requirement than the enchant previously had. The enchant will now scale up as you level up, making the enchants far more useful while leveling. However since you will be changing items while you level it is of minimum benefit unless you are enchanting heirloom items. Even without heirlooms though, even getting a few extra levels use out of an item due to scaling of enchants is useful. It is important that this change is mainly for scaling down. Meaning that if you apply a high level enchant that would normally grant 100 of a stat to a level 90 player to a low level piece, it may only grant 10 of that stat. However if you apply a low level enchant that only grants 10 of a stat to a level 90 players item, it will only still grant 10 of that stat. 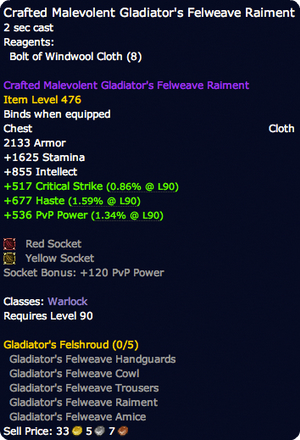 The scaling talked about above also applies to all of the other item enhancements in the game, such as those from engineers, leatherworking, tailoring, and vendors. The enhancements can be applied to pretty much any level and will scale to the items level. Cooking and Engineering also have some changes to some of the items, many to how they scale. 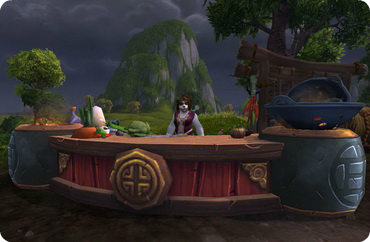 Cooking gains several new recipies in the form of the mighty Pandaren Noodle Carts which grant even more stats than the old banquets and come with 5 charges so that you can put them out several times. The carts do function a little differently though in that players must buy the soup from them. Yet since this new patch is still in PTR on World of Warcraft, it is not certain that the things talked above will be seen on the real servers.